"We're below the city, below the subways. There's a whole world of tunnels and chambers that most people don't even know exists. It's a forgotten place." The series still enjoys a small cult following that is no doubt delighted about this release. I was actually a bit excited myself, even if only for nostalgic reasons. 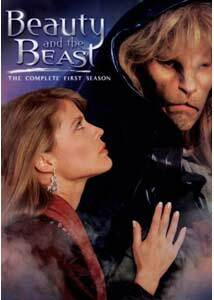 I had seen Beauty and the Beast a few times during its initial run and had found it charming and kind of cool. The hushed poetry and impossible love were always a bit dense, but the fantasy underground world, heavy allegory, and especially the performances kept things interesting. I'm happy to say that the elements that I remember still hold up. The romance is sometimes unbearably (if intentionally) cheesy, but the leads are pretty phenomenal, and it still makes living in the sewer seem cool. Gradually, she learns all about the world beneath the sewers, where a peaceful society of outcasts has taken refuge and made lives for themselves. It's been a perfect place for the beast with the soul of a poet who was brought there, orphaned, as a child. The mysteries of Vincent's birth will begin to reveal themselves later in the season, but suffice it to say he would have a difficult time of things in the world above. Catherine's attack and her encounter with Vincent leave her a changed woman, and she drops her cushy job to work as an investigator at the district attorney's office. That job is the basis for most of this season's episodes. Indeed, it bills itself as a crime drama as much as a romance, with Catherine taking on all manner of thugs, mobsters, and corporate baddies. It's a good thing to, since the love story can get a little impenetrable. Catherine and Vincent can never be together (presumably because she has a really nice apartment and he lives in the sewer), and all of the ennui could sink things quickly. Ron Perlman and Linda Hamilton are absolutely perfect, though, never letting the material bog down. Perlman's make-up is extremely well done and his ability to act through it is extraordinary. The show has a lot of style, and the creators obviously treat it quite seriously. The sewer world itself is a neat creation; through the clever use of matte painting and frequent but inventive recycled elements, they manage to create a consistent and believable underworld, inspired by Jean Cocteau yet on a TV budget. As the season and the series continue, that world gains more prominence, with some of its denizens turning out to be much darker than the peaceful refugees we meet at the beginning�the underworld's underworld. One aspect of the series that has gone largely unrewarded, but that I found particularly appealing is the antithesis of typical 1980s values being championed all over the dial at the time it originally aired. Catherine starts out as an ambivalent, incredibly rich corporate lawyer, but quickly evolves into a driven and low-paid assistant DA. The underworld that she and Vincent champion and protect is full of the tattered cast-offs from late-'80s New York. Father, one mid-season episode reveals, went underground after having been blacklisted as a communist by the government for opposing nuclear weapons research. The duality at the heart of the show isn't just between Beauty and the Beast, it is between Reagan-era consumerism and its antithesis. Many of the adventures involve Catherine staring down corporate greed, as when her episode-long boyfriend and millionaire Elliot Burch is discovered to be fronting an operation to violently intimidate old people into abandoning their homes. He's looking to build a mini-mall or some such thing. I suspect that was a strong part of the charm of the time: this isn't a rich guy charming a regular gal into his world of luxury, it's a guy living in the sewer convincing a wealthy woman that his is not the worst way to get by. Catherine learns quickly that being wealthy doesn't necessarily mean being nice, and she learns to tread carefully among her upper-crust friends. The season is spread over six discs, with four episodes to a disc. Image Transfer Review: Inconsistent is certainly an appropriate description. The pilot episode, in particular, suffers from graininess and scratches. Later episodes look much better, but the quality varies, even within episodes. Darker scenes in particular, of which there are plenty, often look muddy. For the most part everything is watchable, and sometimes quite nice. Just unreliable. The full frame aspect ratio matches the show's original presention. Audio Transfer Review: The Dolby mono audio is perfectly OK. Not great, not awful, it's a fine presentation of the show's original soundtrack. Extras Review: In spite of the shows cult following, not a thing. Even with zilch for extras and unreliable picture quality, fans of this show (and they're absolutely out there) will likely be delighted to have the entire first season, uncut. Myself, I couldn't get enough with its tough and perfectly suited leads, but I have no doubt that others of equally flawless taste will find its odd and conflicted mixture of crime-drama, over-the-top romance, and fantasy a bit tough to swallow. I'd certainly recommend checking it out, but you may want to hold off buying until you've caught a few episodes.